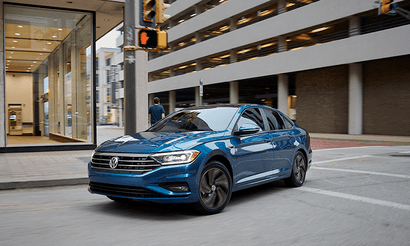 *Closed end lease financing available through April 30, 2019 for a new, unused 2019 Jetta 1.4T S with automatic transmission, on approved credit to highly qualified customers by Volkswagen Credit through participating dealers in Illinois; Iowa; Minnesota; South Dakota; Wisconsin; North Dakota; Indiana; Kentucky; Texas; Colorado; New Mexico; Wyoming; Missouri; Nebraska; Kansas and Oklahoma. Monthly lease payment based on MSRP of $19,545 and destination charges less a suggested dealer contribution resulting in a capitalized cost of $20,666.78. Excludes tax, title, license, options, and dealer fees. Monthly payments total $9,711 and include acquisition fee of $675. Your payment will vary based on final negotiated price. At lease end, lessee responsible for disposition fee of $395, $0.20/mile over 30,000 miles and excessive wear and use. Offer not valid in Puerto Rico. See your Volkswagen dealer for details or, for general product information, call 1-800-Drive-VW. ©2019 Volkswagen of America, Inc.